Harry B. Helmsley was "Mr. New York Real Estate" for many decades, the most respected man in the industry. He and his second wife, Leona, built this 46-story hotel in 1971 and gave legendary parties in their penthouse apartment in hotel. Designed by Emery Roth & Sons, the yellow-brick hotel extends through the block to 58th Street where is setback in a plaza and driveway. At its western edge, the hotel has a through-block arcade. The hotel's tower has never won architectural awards, but Mr. Helmsley would six years later redeem himself with most architectural critics as the savior of the Villard Houses on Madison Avenue across from the back of St. Patrick's Cathedral, which he preserved by erecting the New York Palace Hotel just to the east of them. That major luxury hotel project, where the developer's wife, Leona Helmsley, ruled as queen until her subsequent conviction on tax fraud, is one of the nation's most spectacular examples of the adaptive re-use of a landmark. The low-rise set of six connected townhouses, popularly known as the Villard Houses, four of which surround a large courtyard, were an official city landmark that were expensive to maintain. They comprised the largest portion of the site, which occupies almost half a full block between Madison and Park Avenues facing the rear of St. Patrick's Cathedral. On Central Park South, the 640-room Park Lane required the demolition of several low-rise buildings as well as two apartment buildings, one 12 stories and one 15 stories. "[It] constituted a forceful if banal flat-topped addition to the skyline. Its construction was a big financial gamble not only because of its $30 million budget but also because, instead of relying on convention-based business like the era's other skyscraper hotels, it pursued the affluent individual traveler. The building is design as a slab with travertine piers separating vertically arranged rows of windows, running nearly the full height of the principle facade to culminate in arches; at the bottom of the window bands were reversed arches. 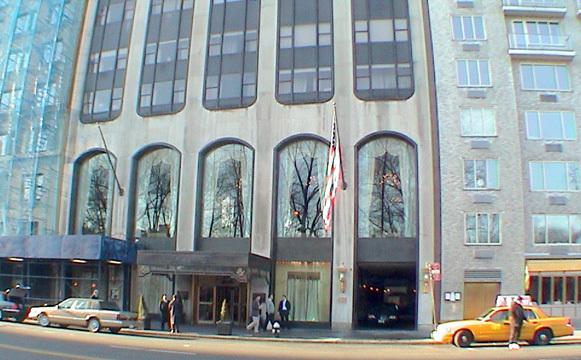 The hotel's principal entrance was on Central Park South, but there was also a porte corchere approached by a semicircular driveway on Fifty-eighth Street. Inside, the public rooms, designed by Tom Lee, an interior designer who specialized in hotels, struggled to marry the designer's taste for a lighthearted contemporary approach with the client's request for traditional decor. Lee, who had designed for the stage, said that 'designing a hotel is like producing play,' and his interiors for the Park Lane wee infused with a sense of drama. The lobby had marble floors and walls and nontraditional crystal chandeliers; some of the public areas featured carved valances fashioned after the designs of the English Baroque woodcarver Grinling Gibbons. The hotel's main dining room, on the second floor overlooking Central Park, was distinguished by nineteen-foot-high ceilings and walls papered with a design based on decorative motifs used in the sixteenth-century royal chateau at Fontainebleau." While it is true that the Park Lane is not an architectural masterpiece, its erection helped infuse some new life to Central Park South, which was hurting at the time, economically and it filled a need for new luxury hotel rooms then.